Dr. Chris Moore conserved Long Branch, a residential preserve, along Lookout Mountain a number of years ago to honor the mountain’s heritage. The Moore family has been in the Chattanooga area for over several generations. “It was something that ran in our family, this love of the land and our community,” reflected Dr. Moore. Dr. Moore wanted to make sure that he partnered with a local conservation group, one that would be around for years to come. Today, Dr. Moore is particularly pleased after an announcement by the Lookout Mountain Conservancy that it has been awarded National Accreditation by the Land Trust Alliance. Only 230 conservation groups of its type (out of 1,700) from across the country have been awarded accreditation since the fall of 2008. Lookout Mountain Conservancy is only the third conservation organization, known as a land trust, in Tennessee to receive the award. The accreditation process involves the external review of numerous documents and procedures over a 12-18-month period by Land Trust Alliance’s Accreditation Commission, an organization specifically established to oversee the conservation excellence of land trusts nation-wide. “As a conservation ‘Good Housekeeping Seal’ it gives supporters, community members, and foundations like ours, the confidence to know that it is a well-run organization,” said Bruz Clark, President of the Lyndhurst Foundation. The Lookout Mountain Conservancy is a local land trust that works with area landowners to create conservation plans and voluntary conservation agreements. Landowners continue to own the land and manage the land and can sell, lease, give it away or mortgage the land. The property stays in private ownership and on the tax rolls. In addition, the Conservancy works to establish local trails and parks, working with volunteers and area students to enrich their academic experiences with hands-on learning and education. Landowners can donate land to the organization or, if funding is available, the Conservancy can purchase the land to establish as a park or trail. Most recently, this work has been focused on the John Wilson Park, on the eastern slope of Lookout Mountain working with students in a summer job-corps program supported by the land trust’s membership and business partners. “This is a land trust that is making a difference in our community,” reflected Melissa Greever, Head of the Science Department at The Howard School. Mrs. Greever has partnered with the organization for the past two years to bring science, art and personal growth to her urban high school students as well as introduce them to life in the out-of-doors. Yet there are many different ways to view the Accreditation stamp of approval. For funders, those groups who help support area nonprofits, it’s a welcome statement of excellence and good management. Those future generations are something that Ron Harr, President and CEO of the Chattanooga Chamber of Commerce, thinks about a lot. The Chamber has been working with local groups to improve the quality of life and economic opportunities and training, and sees the work of the land trust to be part of that solution. One of the area’s conservation leaders was particularly pleased about the work of local conservation organizations, like the Lookout Mountain Conservancy. “Chattanooga has been blessed with more than a century of visionary land conservation leadership, both through the community efforts and through the leadership of individuals and area nonprofits such as land trusts,” states Allen McCallie, recipient of the Trust for Public Land’s Douglas P. Ferguson Award, a national award for land conservation leadership. The connection between people and the land, and conservation and education, is increasingly documented by national and international research. This coming fall the Lookout Mountain Conservancy will be completing the Civil War historical review on the John Wilson Park extension, thanks to the support of local members and businesses. Founded in 1991, the Conservancy’s focus area covers the full 93 miles of Lookout Mountain, from Hamilton County, Tennessee to Etowah County, Alabama. The mission of Lookout Mountain Conservancy is to protect Lookout Mountain’s scenic, historic and ecological resources, through conservation, advocacy, recreation and education for current and future generations. The organization provides environmental education and information to landowners and other interested parties about land conservation options. And Lookout Mountain Conservancy promotes greenway development and conservation planning. Contact Robyn Carlton, LMC CEO at 423-322-8053 or visit the website www.lookoutmountainconservancy.org. See national coverage of one of LMC’s programs in the “Good Health for All” article on the Land Trust Alliance’s website. 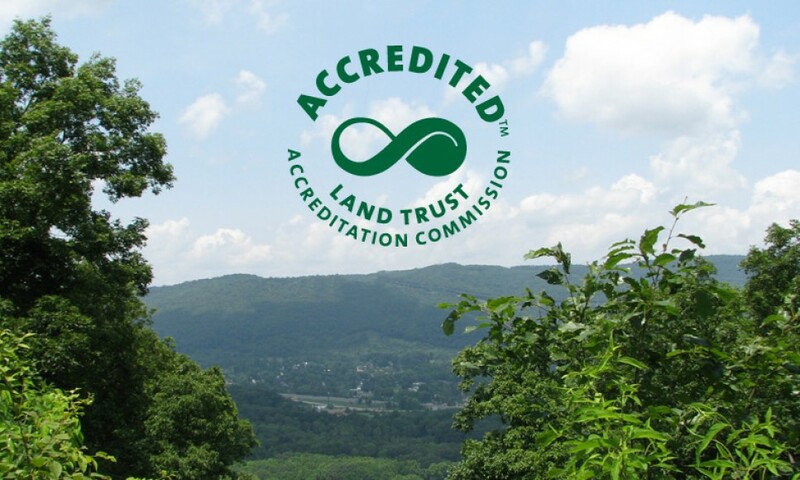 The Land Trust Accreditation Commission, an independent program of the Land Trust Alliance, awards the accreditation seal to community institutions that meet national quality standards for protecting important natural places and working lands forever. The Commission is governed by a volunteer board of diverse land conservation and nonprofit management experts from around the country. More information is available on the Commission’s website, www.landtrustaccreditation.org. The Land Trust Alliance is a national conservation group that works to save the places people love by strengthening conservation throughout America. It works to increase the pace and quality of conservation by advocating favorable tax policies, training land trusts in best practices and working to ensure the permanence of conservation in the face of continuing threats. The Alliance publishes Land Trust Standards and Practices and provides financial and administrative support to the Commission. It has established an endowment to help ensure the success of the accreditation program and keep it affordable for land trusts of all sizes to participate in accreditation. More information can be found at www.landtrustalliance.org.